Enrolling your child in an educational enrichment program is a great way to help him or her get ahead at school. Another great way is to get involved in academic extracurricular activities. Academic extracurricular activities focus on making learning exciting and fun, and many help students show leadership and improve working in teams. Of course, they also look pretty good on a college application. 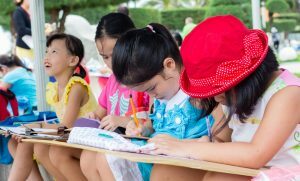 Here are some great academic extracurricular activity examples for students from elementary up to high school. Science Olympiad is a science and problem-solving competition that kids can participate in from Kindergarten to 12th grade. Usually competing in multiple areas, students might work solo in one or two events, but the majority of the challenges are group projects with a hands-on emphasis. Topics include genetics, earth science, chemistry, anatomy, physics, geology, mechanical engineering, and technology. While any school or even any class can have its own spelling bee, the most famous spelling be in the U.S. is the Scripps National Spelling Bee. A great way to learn and practice language, the spelling bee tests each student’s vocabulary, and students who participate in school teams or study programs can really increase their understanding of language. Students can participate from 1st grade all the way to 8th. That’s right. Bees are no longer just for spelling, and the National Geography Bee is a prime example of how academic extracurricular activities can help students improve at topics less emphasized in schools. In fact, the goal of this competition is to increase student interest and knowledge of Geography. Who knew there were so many types of bees? And since teachers are seeing fewer and fewer students with a solid knowledge of history, the national history bee is a great way for students to get a boost in that area. It has two different divisions. The elementary division is 6th grade and below, and the middle school division includes 7th and 8th grades. Math Olympiad is another academic extracurricular activity where students work in teams. In this case, they’re solving math problems. Math Olympiad has two divisions: grades 4-6 and 6-8. Students can compete both nationally and internationally. The teams who compete in the World Scholar’s Cup get a lot of different experiences all bundled up in one competition. They will debate, test their knowledge with a quiz bowl, collaborate to write persuasive essays, and test their knowledge and confidence with a challenging multiple choice test (multiple answers may be correct – for every question!). Besides being a great team-building experience, the World Scholar’s Cup also offers opportunity for travel and cultural experience with an international competition! *For that reason, eligibility and divisions are actually determined by age rather than grade. Mock Trials give students experience with public speaking, research, and our legal system. Starting in elementary, students get to explore the court format using scripts for fairy tale trials. As they get older, however, students will have to research the laws and the crime and prepare their own arguments. That’s when the competition aspect picks up, culminating in the National High School Mock Trial Championship. Some schools may offer Moot Court instead, which is similar but focuses on a different type of crime and court emphasis. Who said that academic extracurricular activities are dry and boring? In this competition, students work in teams of 3-10 to build a model rocket that carries a raw hen egg up to 775 feet and stays in the air for 41-43 seconds. Teams can be registered through schools or non-profit youth organizations. If your child likes engineering and is ready for a serious design-build challenge, this may the extracurricular activity you’ve been looking for. Debate is a wonderful way for students to develop logic and reasoning skills. One of the major changes to school testing is the emphasis on support, and students in debate will get practice supporting their opinions while also building teamwork and having fun! TEAMS stands for Tests of Engineering Aptitude, Mathematics and Science. Working in teams of 4-8, the students study competition scenarios to prepare for the competition. Beforehand, they will have to write a team essay, and on the day, they will have a multiple choice test and design/build assignment. Model United Nations is exactly what it sounds like – a model of the United Nations. Like the United Nations, it offers the opportunity for broadening and diversifying outlooks. At the same time, it offers students a greater understanding of how international politics work. Some schools pair this team with history classes like A.P. Government, so check with your school to find out when you would be eligible to join. Quiz Bowl, Quick Recall, Quiz Team – whatever your school calls it, almost every school has some sort of academic quiz team (it’s probably the first academic extracurricular activity you thought of for high school). In these competitions, students buzz in to answer questions on topics from almost any subject, including but not limited to current events, science, math, literature, fine arts, history, etc. Because of the buzzing in, there is also an element of speed, and you will quickly see different students develop their own strategies! In Academic Decathlon, students compete by giving speeches, writing essays, being interviewed, and taking tests in Art, Economics, Literature, Math, Music, Science, and Social Science. There is also a hands-on component called the Super QuizTM, where students solve challenges in every subject in front of a live audience. It’s pretty intense, and it’s great experience for high school students. And don’t think that if your student doesn’t have a perfect GPA, he or she won’t have a chance to compete. Schools are required to have students from 3 different GPA levels in order to compete at all, so students at all levels can learn and grow through the competition, which may make it one of the most broad-reaching academic extracurricular activities out there. While there are many test-based competitions, not many of them take place outside. In Envirothon, teams will travel to the testing site, often a state or national park, and there, they will take 5 tests as a group: Aquatic Ecology, Soil/Land Use, Current Issue, Forestry, and Wildlife. Each test is taken in a different nature setting (by a stream or pond for Aquatic Ecology, in a wooded area for Forestry, etc. ), and students will have to answer questions about their surroundings as part of the test. Throughout the day, students will most likely listen to a speaker or see a presentation about a specific topic related to the environment. They learn, compete, and have fun, and most importantly, they get to do it all outside! *Different states may have different age requirements for teams. Some may even have elementary-evel teams. Contact your school or check your state’s Envirothon website to find out when your child would be eligible. There you go.15 academic extracurricular activities that kids will love. And don’t panic if your school doesn’t offer one of them. You may be able to start a new team through the school or through a non-profit youth organization. Your school might also offer other academic extracurricular activities that you like even more. The best way to find out is to get involved. Ask the teacher or guidance counselor. Ask questions at the orientation night at the beginning of the year. Check out the website, or even ask other parents. Parents like you – what are your child’s favorite academic extracurricular activities? Do You have anything else for elementary?